The Orientation control puts up a full screen message if the orientation changes. If your app is only designed to run in Portrait mode and the user rotates to Landscape, it will black out the screen and ask the user to rotate back. The previous content of the screen will display once this happens. It can also be set to make Landscape the allowed orientation. To use it, select it from the controls in the Toolbox so it gets added to the Project Explorer. It will not show on the Design Screen. To remove it, highlight it in the Project Explorer and delete. Once added to any form, it will apply to the entire project. messageLandscape Text displayed when rotated. messagePortrait Text displayed when rotated. screenOrientation Normal orientation: Portrait or Landscape. Design time only. While no code is needed to use this control, here are a some useful functions for dealing with orientation. 'This function is called if the orientation of the device is changed. 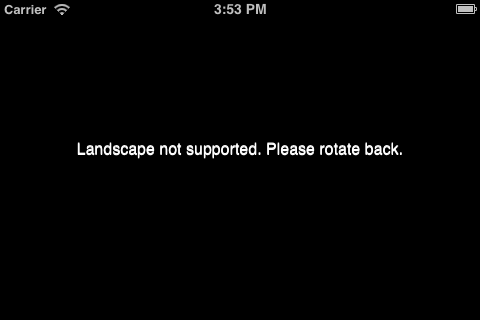 If the screenOrientation is "portrait", the message above will be displayed when the screen is rotated. This page was last edited on 9 March 2019, at 22:15.